They’re also for realising that somehow there are only ten days of February left, and thus I only have ten more FebPhotoFest posts to do! I have a few of my last photos planned out, and I’m excited to share them with you. 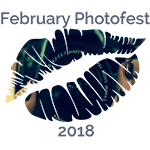 Today’s photo is for both Sinful Sunday and the February Photofest! Kiss both sets of lips to check out everyone’s fabulous photography.